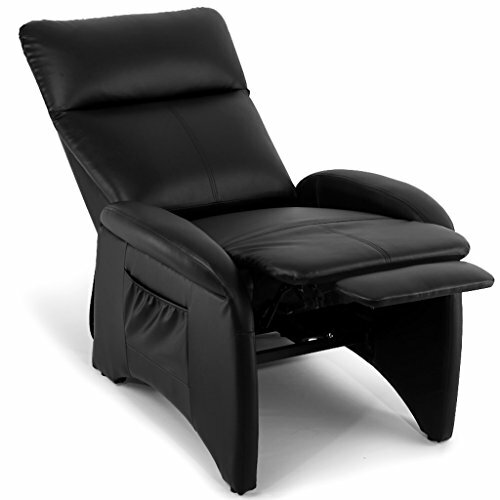 Get ready to relax in ultimate comfort with LANGRIA faux leather recliner sofa chair? Surely you will be a long time reluctant to leave. Featuring the ergonomic reclining design to fully extend to 165° and return to the upright position 105°; this sofa chair is perfect for your relaxation while you are home or at the office. Our recliner sofa chair is upholstered in premium black finished faux leather, adding a sense of stylish to your place while the headrest, armrests and footrest are filled with ample and soft foam, making it very comfortable to sit on and supportive to your arms, legs and body. Made of durable wood and metal material for long-term use, LANGRIA's recliner sofa chair also features a side pocket for you to stash your essential items such as cellphones, magazines or remote controls, making you access to them with ease while relaxing.